The comments by Kejriwal are being seen by many in a political light, as the Union minister has been making jibes at the BJP’s national president, Amit Shah. The Delhi chief minister added, “This programme is very important for the federal structure of India”. The event, held at Udyog Bhawan, was also attended by Union Minister Harsh Vardhan and Deputy Chief Minister Manish Sisodia, among others.“We hope that in future also, working with other departments at the Centre, this positive spirit is shown” said Kejriwal. The comments by Kejriwal are being seen by many in a political light, as the Union minister has been making jibes at the BJP’s national president, Amit Shah, over the party’s loss in Assembly elections in three Hindi heartland states, and recently made a remark that drew attention in the context of the debate over intolerance after Bollywood actor Naseeruddin Shah spoke of the “safety of his children”. Amid questions within the NDA, with alliance partners questioning the leadership of Shah and complaining about not getting their fair share, Gadkari, at an event in Delhi earlier, had said, “If I am the party president and my MLAs are not doing well, my MPs are not performing, then who is responsible?” He added, “I am. What have I done to groom them?”. 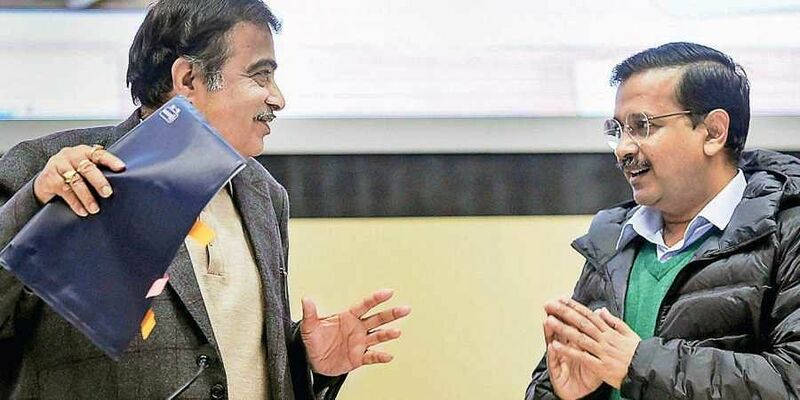 At another event, Gadkari, referring to the country’s first prime minister, Jawaharlal Nehru, said, “tolerance is the biggest asset of our system”.The comments assume significance as the leader from Maharashtra has a good understanding with the RSS and the Sangh Parivar, and might have spoken on directions from them.A total of 11 projects were launched under the Namami Gange programme by the National Mission for Clean Ganga (NMCG) to conserve the river Yamuna in Delhi. Most of the projects are related to sewerage infrastructure and are at various stages of implementation.